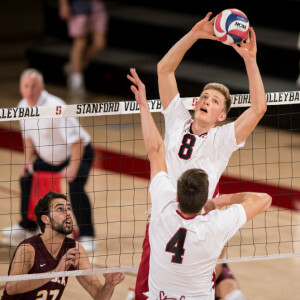 Continuing a tumultuous start to its regular season, Stanford’s men’s volleyball team suffered back-to-back straight-set losses in Southern California this past weekend, dropping its record to 3-6. The No. 13 Cardinal (3-6, 2-4 MPSF) took on No. 9 UCLA (5-3, 1-3) and No. 8 UC Santa Barbara (6-4, 2-4), facing their fifth and sixth ranked opponents of the young season. Yet the two defeats at the hands of the Bruins (27-25, 25-22, 25-21) and the Gauchos (25-14, 25-20, 25-19) put Stanford’s record against top-25 opponents at 0-6. During the first set of the UCLA match on Thursday, Stanford struggled to break through the barrier of UCLA’s front line, which immediately put the Bruins in the driver’s seat. However, picking up on UCLA’s defensive patterns, the Cardinal pushed through and found the holes in their opponent’s defense. Sophomore outside hitter Clay Jones tallied two kills and senior middle blocker Spencer Haly and junior outside hitter Madison Hayden put up strong defensive work. Soon enough, Stanford gained the lead in the set, keeping itself two points ahead of UCLA until the Bruins called the first timeout. Post-timeout, Stanford’s momentum slowed down a bit, allowing UCLA to tie the match. Impressive performances from Jones and junior setter James Shaw helped keep Stanford within arm’s reach of winning the first set, but UCLA managed to push on and capture a tight set at 27-25. The second set was even more closely contested for both teams, with the set going back and forth in points, and kills and service errors on both sides of the court. The Cardinal maintained a small lead over the Bruins for the first part of the set thanks to sharp kills from Jones, Shaw and junior middle blocker Conrad Kaminski. However, deep corner kills from UCLA’s front-row hitters put the Bruins up 12-9. After the a Stanford timeout, the Cardinal managed to reverse the momentum and tie the score, though the Bruins scored back-to-back points leaving the set at 20-18, forcing Stanford to call another timeout. The timeout allowed Stanford to regroup and recover, which resulted in the team tying the set again at 21-21, forcing UCLA to call a timeout of its own. Eventually, UCLA managed to regain its lead, winning the second set and putting the team up 2-0 in the match. The third set saw UCLA take an impressive 8-3 lead, put pressure on Stanford early and not allow the the Cardinal to make plays on offense. Stanford attempted to come back with kills from Jones, Kaminski, sophomore middle Kevin Rakestraw and Daniel Tublin, closing the gap to 15-13. However, UCLA held off the Cardinal, winning the third and final set 25-21, and taking home the victory. Jones tallied the highest number of kills for the night for the Cardinal with 16, and also led the team with a .520 hitting percentage. Shaw trailed close behind, hitting .429, as well as recording 25 assists and six digs. In the first set against UCSB on Saturday, Stanford started stronger, going point-for-point with the Gauchos early. The defense maintained a unified front, getting to both long and short kill attempts from the opposing team. However, after a service error by Shaw, Stanford’s defensive unit started to falter under the Gauchos’ offense, letting them pull away with a 12-7 lead. The Cardinal could not compete with the Gauchos’ aggressive play throughout the set, which gave UCSB a 25-14 first-set win. Stanford showed some fight in the second set, keeping it tight until the 11th point, when the Gauchos broke away from the Cardinal’s grasp, and later taking it 25-20. For the third set, Hayden, Tublin and redshirt sophomore outside hitter Gabriel Vega recorded kills along with a block from Kaminski and Vega to put Stanford ahead, 4-2. The Cardinal managed to keep the score fairly close for most of the set until the final five points, at which point the Gauchos went on a 5-0 run to end the match and secure their victory. Hayden led the team with 10 kills and Kaminski finished the night with a hitting percentage of .375, the highest on the team. Shaw followed through with 27 assists. Next weekend, Stanford will head south once again to take on Pepperdine and Concordia. Both Friday’s and Saturday’s matches are set for 7 p.m. start times and will be televised on Pac-12 Networks. Contact Divine Edem at dedem ‘at’ stanford.edu. Divine Edem '18 is currently a staff writer for the sports section of the Stanford Daily. She is originally from Chino Hills, a small town in Southern California and enjoys playing volleyball, watching movies, and listening to most genres of music. She plans to major in Political Science and can be contacted at dedem@stanford.edu.